Sleek with clean lines. This sofa is a new addition to the modern and beautiful Etra collection. The Sofa is a sleek outdoor furniture design and part of the Etra collection. 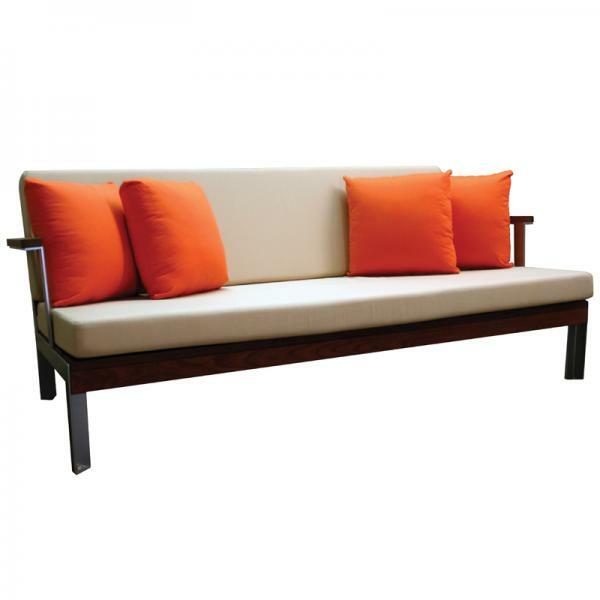 This stylish modern outdoor sofa boasts fine details and modern charm. It comes with an option of a stainless steel frame or a powdercoated steel frame in silver. The surface can be ipe wood or marine-grade polyboard with various color options. Ipe wood is a very durable and solid wood great for outdoor use and superior to teak wood in many ways. It has a tighter grain and darker reddish brown finish. It is a very beautiful and durable outdoor wood. The seat cushions add to the comfort and style and come in colors of snow white, sand, frost grey, chocolate, nutmeg, and lime. The Etra collection is quality made for outdoors with simple, clean, and flawless details. Outdoor furniture must be made to withstand the elements, and the craftsmen of these quality pieces know what they are doing. This modern outdoor sofa chair will last a lifetime. High-grade brushed stainless steel or powdercoated steel. Ipe wood or marine-grade polyboard surface in various colors. Cushions in 100% solution died acrylic outdoor fabric with high density flexible polyurethane foam. H 28.75" x W 71.75" x L 28"